January 11, 2017—News Flash: The California Fish and Game Commission voted NOT to list the flat-tailed horned lizard as endangered or threatened. This petition submitted by the Center for Biological Diversity (CBD) a year and a half ago is finally resolved in favor of off-roaders, farmers, renewable energy companies and land management agencies. Why do we care? If it were to become listed, the CBD would likely then sue State Parks (Ocotillo Wells State Vehicular Recreation Area [OWSVRA]) asking for many restrictions to be implemented. Open riding would probably be a thing of the past and the park would never be the same. Thanks to this decision, the park will begin to allow special events to take place again like Desert Safari, SDORC’s Lost Lizard Fun Run, geocaches, movie shooting, etc. While we celebrate today, it is almost a given that the CBD will try again to get it listed it in a few years. What kept the commission from approving a listing is the fact that 11 government agencies have formed an agreement to manage the lizard and its habitat. The management plan is quite long and intricate. In it there are over six pages of rules they all agree to follow. Because of the listing petition, the Fish and Wildlife agency created a report on the current status of the lizard and in it they recommended not listing. This report was given to the commissioners a few months ago. During the meeting a number of people got up to speak about the lizard; some for and some against listing. A biologist from Arizona who specializes in lizards came to speak and was very persuasive. I got up to speak, as well as other off-roaders, and Dave Hubbard, the off-road lawyer. A very strong comment was given that said listing the lizard could actually be hurtful to the lizard. They said that a listing would cause the land management agencies to have to do much more paper work, taking resources away from actually managing the species. I recently told you about the approval to expand Carnegie SVRA by a few thousand acres. This was very contentious and right after State Parks approved the expansion, three groups sued the state: the CBD, Friends of Tesla and Alameda Creek Alliance. In the suit they claim the state did a bad job of analyzing the effects of the expansion. We have done a lot of work in the last year and I would like to summarize some of it here. The year started out with Feinstein’s desert bill (S.414). While it had some bad stuff in it, it also had some real good stuff too. The bad was wilderness and National Monuments, the good was to make five BLM open OHV areas into National Recreation areas. The deal went south when President Obama used the Antiquities Act to designate the National Monuments outside of the pending legislation. Ormat Technologies, a geothermal energy company, started working on a test well to put a geothermal facility in east Ocotillo Wells. That is on hold as I write this. The Desert Renewable Energy Conservation Plan came out allowing geothermal energy development in OW. I filed a protest on behalf of Friends of Ocotillo Wells and that protest was dismissed, meaning there can be geothermal if a company wants to do it. I was interviewed (for over one hour on the phone) for an article on the Glamis sand dunes by the San Diego Union Tribune (I was in the article for one sentence). I was interviewed by GQ magazine; the article was never approved. The Cleveland National Forest decided to Close Carveacre Rd. I fought it all the way to the end and lost. We did a Gofundme to help CORVA pay for their lawyer to attend a meeting between plaintiffs and State Parks in the Ocotillo Wells lawsuit. We helped Brian Jones, Joel Anderson and Mike Harrison in their campaigns for political offices. All three dropped out of their races. Only Anderson ran for his same senate seat (and won). We started a new Facebook page and are up to 1,200 likes. Please like us if you haven’t yet. We supported a bill, AB2175, to stop the state from stealing $833,000 a month from the OHV account. The bill failed. We performed a cleanup and maintenance of the kids’ training track in Corral Canyon. We did a cleanup on our highway cleanup area along I-8. State Parks tried to close cultural and natural reserves and preserves. We commented against, along with many others. We just found out it’s back with some changes to make it less harsh. We still don’t like it. Yours truly was voted Off-Roader of the Year by CORVA. State Parks announced they want to merge the OHV Division into the bigger State Parks agency. This is still in flux, but likely the OHV Division will stay separate. We put on a wildly successful Lost Lizard Fun Run at Superstition Mountain. Now that Ocotillo Wells is available again, we need to decide in which area to hold this year’s event. Please email info@sdorc.org and let us know which area you would prefer. The CBD appeal of their lawsuit to close a large part of Glamis was denied (they appealed the decision, so it is still alive). 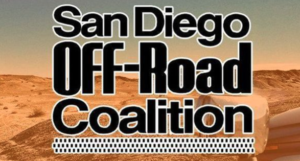 SDORC hired a lobbyist to help us with the reauthorization of the OHV program. I recently went to Sacramento for some preliminary meetings to lay the groundwork for a successful bill. We have been helping an effort to gain OHV access past the railroad tracks on the east side of the Imperial Sand Dunes. We have been busy protecting your right to off-road and we expect this year to be just as busy. The Ocotillo Wells General Plan should be released and implemented, the Ocotillo Wells lawsuit may be settled, we should get a renewal of our state program and many other actions affecting OHV will happen. We would love for you to get involved with us. We are still looking for someone to specialize in either Corral Canyon or Lark Canyon. We need more members (SDORC is a membership organization; you can join us on our website). Please come to our general meetings on the first Tuesday of each month at Ranch House Restaurant. I want to thank Shannon for coming to our last meeting and volunteering to help us. I hope you will be next to offer to help. I look forward to seeing you out on the trail.